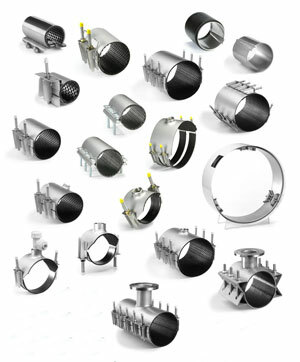 Stainless repair clamps are used to repair corroded or cracked rigid pipe without cutting out a section of pipe. We stock repair clamps made by Huwa. These are high quality well finished products made from high grade materials. The clamp consists of a flexible stainless steel band fully lined on the inside face with a rubber gasket. The ends of the one or more sections of the band are tightened together by long threaded studs. Their ingenious design allows the clamp to be opened out flat so that they can be wrapped around a leaking pipe in-situ with minimal excavation. The flexibility of the design also allows one clamp to fit a wide range of pipe diameters. Different models of clamp are available with one, two or three sets of bolts giving different ranges of pipe diameter tolerance. They can be installed on grey or ductile cast iron, steel, asbestos cement or uPVC pipes. Working pressures up to 30 bar can be withstood, depending on the model of clamp and its diameter and length. It is particularly important to choose a good quality product when making repairs with stainless steel clamps. Some low cost clamps on the market are poorly finished, making them difficult to install and even risking operators getting cut by sharp edged components. In the longer term cheap products may also suffer corrosion if they have been made from substandard material or not correctly normalised after welding during manufacture, issues which will not be apparent at the time of installation. It pays to specify good products such as the Huwa range.